We throw away PET bottles every day without thinking about how they may be used. Do you know that if you recycle them, they can be made into fiber products such as clothing? PET bottles and polyester fiber are made from the same material, PET bottles are used as containers for soft drinks, soy sauce, cooking oil, etc.The production volume of PET bottles steadily increases year after year. 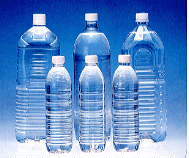 According to the Container and Wrapping Recycling Law, effective in April, 1997, all used PET bottles must be collected. We should be more conscious of the importance of reusing waste and establishing a recycling system. Toyobo would like to make contributions to an environmentally friendly recycling society. In an effort to do so, we are widely promoting a group of products called "ECHORCLUB "
1.PET bottles are not only strong and clean but recyclable. 2.Used bottles are collected and they are assembled together. 3.A mass amount of PET bottles are crushed Into flakes with a rotating hammer. 4.Through a complicated separation process, the polyester flakes are refined. 5.These are the flakes that have been washed and refined. 6.A pellet of high purlty is melted and spun. 7.It is drawn to be a thin strong strong yarn. 8.The yarn is cut and made into staple fiber, ECOR fiber. 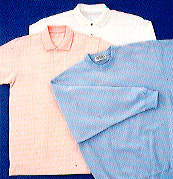 9.A variety of garments and daily life related materials are produced "ECHORCLUB "
ECHORCLUB is a registered trademark of Toyobo in Japan.